After a grey and rainy day, the sun broke through for the Sounders Women game against the Bay Area Breeze. After a long stint on the road, the Sounders were ready to show their home crowd that they were ready to play. In the fourth minute of play the Sounders received a corner. With a driven cross from Janine Beckie, Beth Russell found the ball with her head and powered it toward the goal. The ball pinged off a Bay Area player into the net to put a goal on the board for the Sounders. The match was even throughout the first half with no other real scoring opportunities for either team. With the sun setting, the Breeze came out in the second half looking to score a goal. In 54th minute Bay Area Breeze ripped a shot 25 yards out and Sounders Erin McNulty got her fingertips on the ball to give the Breeze a corner. The save was world class as McNulty got a full extension and saved what would have been a beautiful goal. The battle continued between both teams throughout the second half. In the 74th minute Seattle managed to pick up a loose ball on the top of the eighteen and loft a shot. The shot went just high and the score remained 1-0 in favor of the Sounders. Just a few short minutes later, Bay Area squeezed by the Seattle defense to slice a shot toward McNulty. Bay Area picked up the rebound and chipped the ball back toward goal in an effort to tie the game. In the 90th minute Nikki Ambrose of Seattle placed a perfectly weighted pass through to teammate Melissa Busque who found the pass and slotted the ball past the Bay Area keeper perfectly. Seattle went up 2-0 in the 90th minute and that would be the final score for the game. With this 2-0 win, the Sounders Women remain at the top of standings with 20 points. 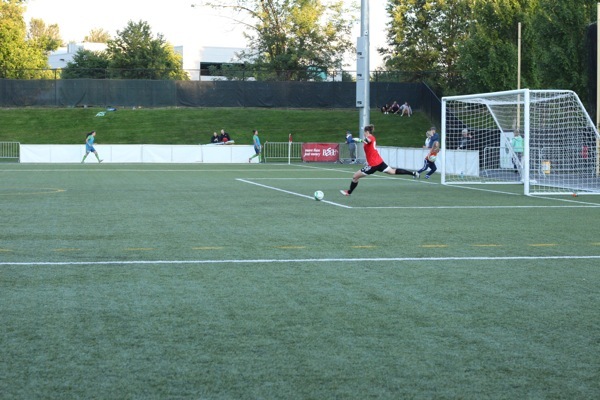 The Sounders will be back at Starfire on Sunday to take on Pali. Kickoff is at 3:30 pm. Click here to find more information and tickets to the game.